Eligible candidates can apply online from 20.04.2018 to 31.05.2018 (extended up to 31.05.2018) for Sanskrit Edu. and 17.05.2018 to 16.06.2018 for School Education posts through official website of RPSC i.e. http://www.rpsc.rajasthan.gov.in or http://rpsconline.rajasthan.gov.in. B.Ed. and Post Graduate Degree in the concerned subject/s recognized by Govt. 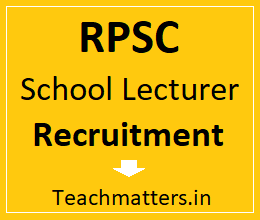 Eligible candidates can apply online for the posts of RPSC School Lecturer Comp. Exam 2018 through official website of RPSC from 17.05.2018 to 16.06.2018 through RPSC One Time Registration (OTR). Here is subject-wise syllabus of RPSC School Lecturer (Sanskrit Education) 2018. RPSC will hold written examination for the selection of School Lecturer (Sanskrit Education Department) 2018 in 2018. The candidates who are appearing in this written test / screening exam for the post of School Lecturer can download syllabus for their subject as .pdf. from the official website of RPSC as and when the detailed syllabus is available on the website. Shiksha Shastri/B.Ed. and Post Graduate Degree (with minimum 48% marks) in the concerned subject/s recognized by Govt. Eligible candidates can apply online for the posts of RPSC School Lecturer Comp. Exam 2018 through official website of RPSC from 20.04.2018 to 09.05.2018 (extended up to 15.05.2018) through RPSC One Time Registration (OTR).